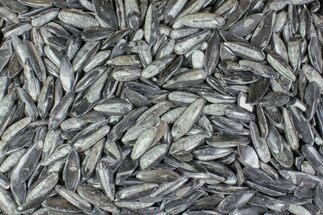 This is a wholesale flat of 24 pieces of stunning, fibrous Malachine from the Congo. This malachite contains millions of malachite needle-like crystals, all packed into dense fan like projections, leaving the combined terminations with a botryoidal appearance. 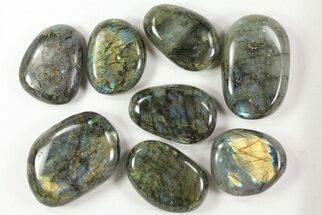 These dark green specimens, have a beautiful silky shimmer throughout and chatoyant banding around the edges. The pieces range from 2-3" wide with most being closer to 2 1/2. At $335 for the lots that comes out to just around $14 per piece. 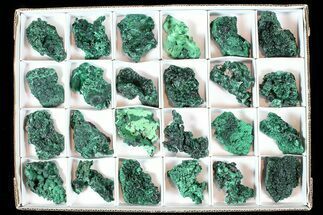 Malachite is a basic copper carbonate with the chemical formula Cu2CO3(OH)2. 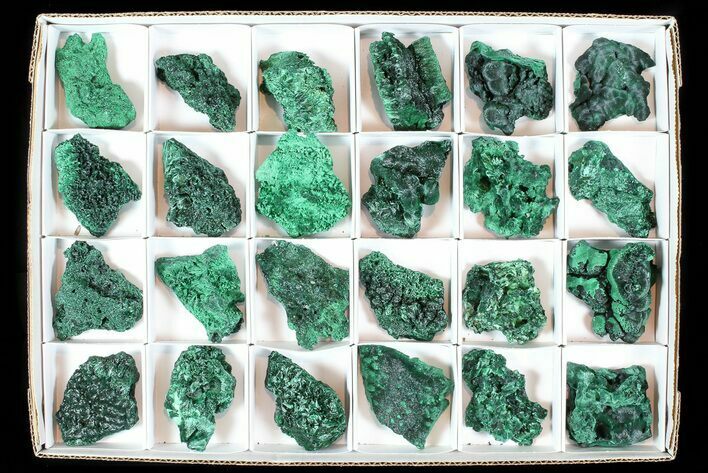 This mineral is known for its intense green color, along with the wide variety of formations and patterns that it's found in. 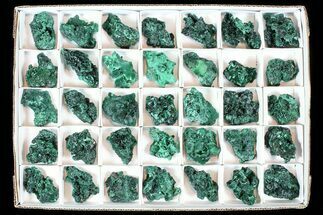 Malachite can grow in botryoidal masses, stalactitic, and reniform formations, typically as a tight cluster of fanning fibrous needles that make up a seemingly solid mass. 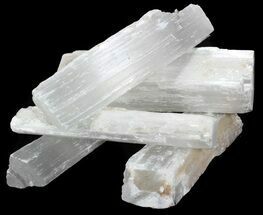 As layers continue to stack during formation, a banded pattern can sometimes begin to take shape, which explains the rings in all shades of green that are seen on most polished malachite specimens.